The 4th Annual Feet in 2 Worlds Food Journalism Workshop – Telling Immigrant Food Stories – will be held in San Francisco, May 31 – June 2, 2019. The workshop is designed to help journalists, journalism students and culinary professionals improve their skills telling food stories from immigrant communities. Led by veteran journalists from public radio and online media, this three-day intensive workshop is an introduction to broadcast and podcast journalism, including audio recording and production, story development, and pitching and writing for radio. Participants will have the opportunity present their story ideas to a panel of editors from leading media organizations. Learn the basics of audio field recording and production, improve your story pitches, make valuable connections in journalism. Who should apply? Journalists who cover immigrant communities and culinary professionals and journalism students interested in telling stories about the diversity of food in America today. Journalists from immigrant backgrounds are strongly encouraged to apply. To apply, go to our webform. For more information email: contact@feetin2worlds.org. Presented in partnership with Civil Eats and Making Contact. Major funding for the workshop comes from The International Association of Culinary Professionals’ foundation, The Culinary Trust, and its Growing Leaders Food Writing program. The Food Writing Program is funded with the support of the Boston Foundation. Support also comes from Grow and the Bi-Rite Family of Businesses. The three-day intensive workshop, to be held in the Bay Area, May 31 – June 2, is an introduction to broadcast and podcast journalism, including audio recording and production, story development, pitching and writing for radio. Participants work with veteran public radio journalists and podcasters and have a chance to present their story ideas to a panel of editors from leading news outlets. The coordinator is involved in a wide variety of activities including planning, community outreach, and communication with workshop participants, instructors and partner organizations. The coordinator works with the Feet in 2 Worlds staff to ensure a successful workshop experience for everyone involved. 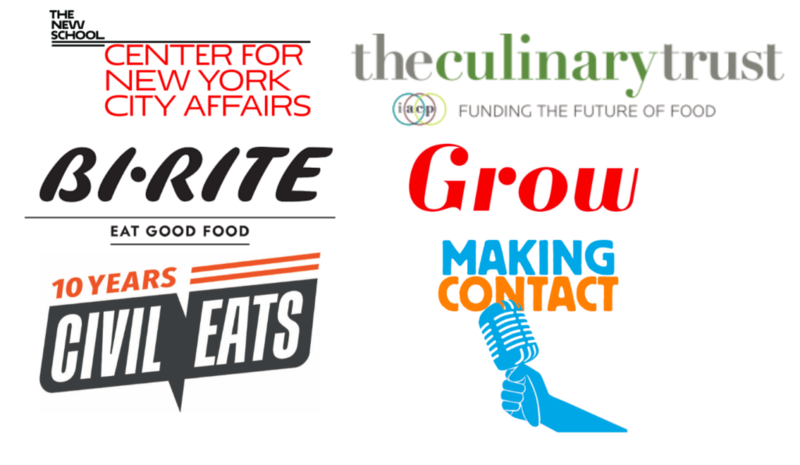 Outreach to local journalists and culinary professionals. Help design and implement social media promotion. Organize and manage the online application process using Google forms and Trello. Setting up the workshop venue. Communication with workshop attendees and presenters before, during and after the workshop. Coordinating meals for the workshop. This is a part-time, hourly position for someone located in San Francisco or the East Bay. To apply please send your resume and a cover letter with the subject line “Food Journalism Workshop Coordinator” to contact@feetin2worlds.org. Feet in 2 Worlds is an award-winning news outlet and media training program that tells the stories of today’s immigrants to the rest of America. Over the past 15 years we have trained and mentored hundreds of immigrant journalists, the majority of whom are women of color, helping them reach audiences on public radio and online news sites and advancing their careers. Support for the workshop comes from The International Association of Culinary Professionals’ foundation, The Culinary Trust, and its Growing Leaders Food Writing program. The Food Writing Program is funded with the support of the Boston Foundation. 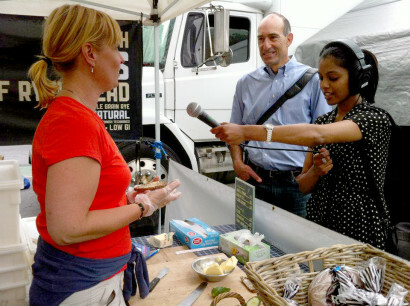 We host an annual workshop that focuses on food journalism, story development and audio story telling. Here are some of our previous workshops. Are you a journalist or media-maker from an immigrant background interested in covering food and related subjects in metro Detroit? Tuition: $250 (includes all instruction, materials, use of recording equipment and meals). Scholarships and travel stipends are available to qualified applicants. Food is culture, food is family, food is health, food is politics, food is tradition. Food can make living in a new land with unfamiliar customs and a new language tolerable for immigrants. Food is also one of the most enduring points of connection for Americans who have lost touch with the culture and language of their immigrant ancestors. 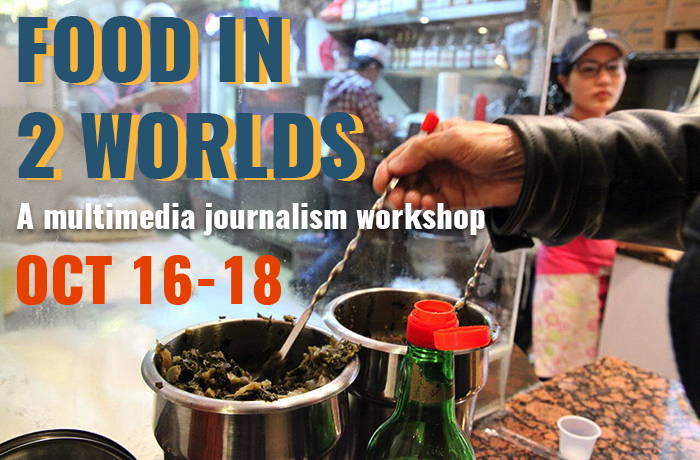 This intensive workshop is designed for journalists, journalism students and culinary professionals who want to tell compelling and insightful food stories from immigrant communities. Participants will learn basic skills in audio recording and production. Writing skills will also be emphasized. Each participant to leave the workshop with at least one fully produced multimedia story for the web and story pitches for future work vetted by a panel of editors and veteran journalists. The workshop will be held at The New School in New York City, and is run by Feet in 2 Worlds, an award-winning radio and web journalism project at the Center for New York City Affairs at The New School. Funding for the workshop comes from The International Association of Culinary Professionals’ foundation, The Culinary Trust, and its Growing Leaders Food Writing program. Applications are now closed. Accepted applicants will be notified on Friday Aug 21st.